So, I know that Thanksgiving is over. Most people have moved on & their focus is now on Christmas & presents & so on... but I'm a little behind over here. I'm still stuck on thankful. Now, of course, I'm thankful for all of the things I mention every year: family, health, love, faith, my pets, surviving another year of school... and the list goes on. Those things are very important to me, and they always will be. But this post is not just about me & my personal life & all of those things I'm thankful for each year. This post is about you guys. The final push that got me to start this blog was my boyfriend. He told me that I should go for the whole blog thing, & he promised me that he would always read it. So that meant I was guaranteed one reader. Plus my mom- I knew she would read it, cuz she's my mom & that's what moms do. That made two readers... & as long as I had two important people reading my blog, that was good enough for me. I then decided to share my little blog life with the Facebook world, and was over the moon when 60 people had viewed my first post. I was just so happy to have an excuse to make more food & take pictures of it; knowing people were looking at it was a bonus. I remember literally taking a picture when I hit 1,000 views. I was so excited! 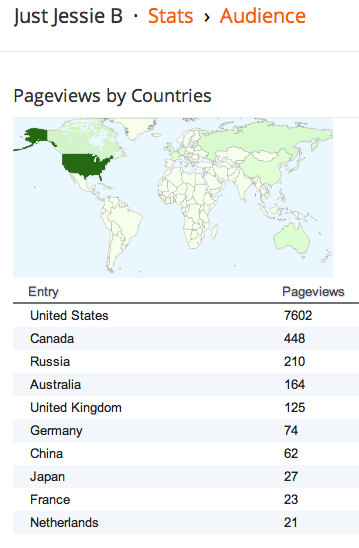 & I had NO IDEA that my little blog would ever reach 25,000 views-- let alone in just a few months. I am thankful for YOU. Yes, you-- for reading what I have to say! Whether you made one of my recipes, shared my blog with others, left me a comment, talked to me about my blog in "real life", or even just gave my blog a quick glance & moved on... I am just thankful for the moments that have been taken from all of your busy lives to visit here. Whether you are a family member (Hi grandma! ), an old friend, a fellow grad student escaping study time, another Paleo-eater, or a new friend: Thank you! I would LOVE to hear any feedback you guys have, and welcome ANY & ALL questions! If there's something you're looking for & would like to see...... (e.g., more breakfast ideas, "what I ate" posts, easy dinner ideas, etc.) OR, if you have any questions regarding the Paleo diet in general (e.g., "Why shouldn't I eat grains?" or "What's so bad about peanuts? ")~ please feel free to ask. If I don't know the answer, I will gladly research it & write up a little post about it to help you out. We can all learn together! That's all for now, & I promise to be back soon; next time with a recipe. Thank you all again~ I appreciate each & every one of you! P.S.~ If you want to be alerted when I post in the future, make sure you become a "follower" or subscribe using your e-mail address! I do a little happy dance each time I see someone new. Thank you mama :) Love you! It would awesome if you could do like a little tips and tricks post about how to stay on track during these next few weeks. There is tempting food EVERYWHERE. Also, healthy cocktail alternatives? I love the wine spritzer and plan on making a big ol pitcher of that for the fam bam, but what about those warm, fireplace drinks? ALSO :) [you should get rid of this comment section because of people like me] do you do any exercising? you're tiny. itty bitty. do you do anything besides eat like a champ? if not, I envy you.